Do you know of any little mischief makers that cause as much mayhem as Thing 1 and Thing 2? When the Cat in the Hat lets them out of the box, he doesn't even have time to think of names for them before they start running around and causing a ruckus, so he just keeps calling them Things 1 and 2 to save time. Actually, we don't know if that's true, but they don't seem to stand still long enough to answer any questions about it. 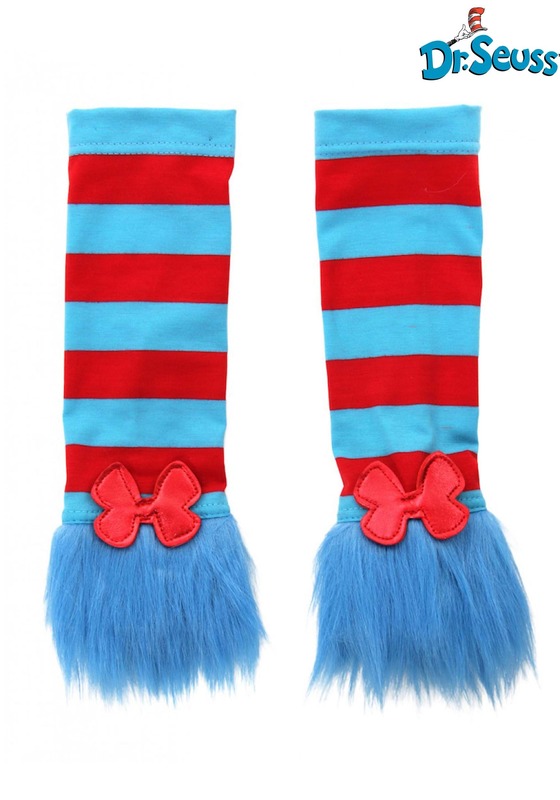 Of course, if you're whole plan is cause mischief, then they are the perfect Things to dress up as, and you'll definitely want these fun Thing 1 & Thing 2 Glovettes glamming up your arms, as well! These red and blue striped elbow length glovettes represent the latest in Thing-fashion trends, and have matching fuzzy blue fur and big red ribbons around the wrists. Wear them with your Thing 1 or 2 costume, or to add some colorful style to when you're spreading mayhem in your everyday outfits!